Shop online for over 30,400 in stock model trains at discounts up to 90%. Freight Cars is the most popular of the 17 in stock model trains categories, then Buildings, and Railroad Scenery. Woodland Scenics is ranked #1 out of 305 in stock model trains manufacturers, followed by Bachmann, and Atlas. 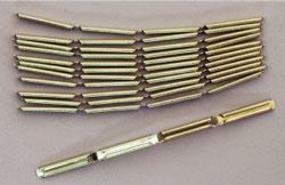 This is a Set of Atlas Track Nails (HO and N Scale) for experienced train collectors.